The cis elements or zip codes (Singer 1993) responsible for prolamine RNA targeting to the PB-ER were defined by studying the localization of RNAs coded by a series of GFP-prolamine cDNA genes in transgenic rice endosperm cells (Hamada et al. 2003b). GFP RNAs, which normally are localized to the cisternal ER, are redirected to the PB-ER when prolamine RNA sequences are attached to the 3'UTR. Deletion analysis of the prolamine sequences showed that two zip codes are required for PB-ER targeting. One zip code is located downstream adjacent to the sequence encoding the signal peptides, while a second cis element is located in the proximal half of the 3'UTR (Hamada et al. 2003b). Both cis elements share considerable homology, suggesting that recognition by trans-acting factors is sequence dependent. The majority of cis elements responsible for RNA targeting do not share a common sequence, but are dependent on the formation of an exact secondary and/or tertiary structure. This is supported by ongoing studies to identify the cis elements responsible for the targeting of the 10-kDa 8-zein RNA to the PB-ER in developing rice endosperm. Despite the relatively small size of this transcript, the RNA appears to have at least four cis elements. Three are located within the proximal two-thirds of the coding sequence including the signal peptide and a fourth is located in the 3'UTR (Washida et al. unpublished). A direct alignment of the RNA sequences of these four regions indicates very little sequence homology and no common motifs are evident. Moreover, there is no sequence similarity between the cis element of rice prolamine (Hamada et al. 2003b) and those of the 10-kDa 8-zein. This lack of sequence conservation between these RNAs suggests that the cis element responsible for PB-ER targeting is structural in nature and that its sequence is less important. Both the rice prolamine and maize 10-kDa 8-zein require at least two cis elements for restricted localization to the PB-ER. These multiple, functionally redundant cis elements may act synergistically to ensure efficient transport. Other examples of mRNAs with multiple redundant cis elements are found in Xenopus oocytes (Vg1: Desher et al. 1998; Mowry and Cote 1999; Yaniv and Yisraeli 2001; Fatvg: Chan et al. 1999), Drosophila oocytes (Nanos: Berg-sten et al. 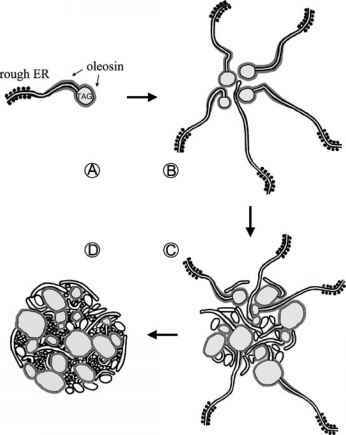 2001), and budding yeast (Ash1: Gonzalez et al. 1999; Chartrand et al. 1999). In many cases, the location of these multiple cis elements is restricted to the 3'UTR. The presence of one or more cis elements in the coding regions of the rice prolamine and maize 10-kDa 8-zein may confer another function in addition to their role in RNA localization. The yeast Ash1 RNA has four cis elements, three of which are located within the coding region. Chartrand et al. (2002) obtained evidence that these three cis elements are required for transport and localization of Ash1 RNA to the bud tip, and for preventing premature synthesis of the protein during its transport to this location. If the rice and maize cis elements also play a similar dual function, this would be consistent with the requirement for translation initiation where rice prolamine RNAs are transported in translationally arrested complexes to the PB-ER.